You always show the most yummilicious and dreamy places. I'm all about the white! I love to see white warmed up with wood pieces. 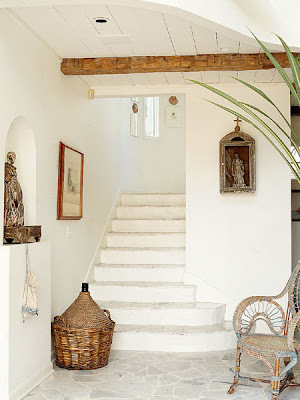 The first picture is awesome when you add the texture of the basket and I love the wood beam on the ceiling. 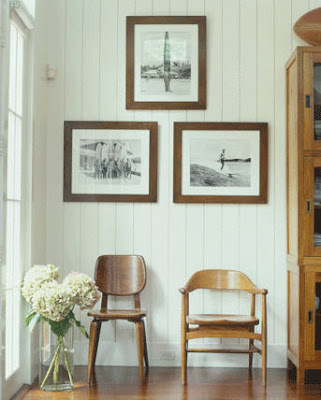 The third picture shows truly how warm white can be with the chairs and the pictures on the wall. But, honestly? I loved all of them for various reasons. Oh, I'm loving that tropical garden! So lush! So Florida! Fabulous! I am so happy you "cleaned up" your files, Linda! I love the adorable chair on the left in the fifth photo. And the garden photo is dreamy. 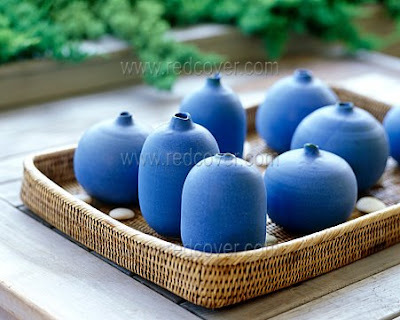 I LOVE those inspirationjal ideas. The first pictre and the one with the two chairs and artwork are my favorites. Yes!!! My favrotie is the bottom picture - love all white & I love the leaves on the DR table!! Yes Linda, they all "SPOKE" to me but especially the second one from the top. All that lush green soaked deep into my being. These are all beautiful...I think I need a vacation! ohhhh, I find it so very interesting that I am drawn, intensely, to the clean white, stark rooms and I live in colorful, packed with crap rooms. They're all gorgeous, but I love the first one! 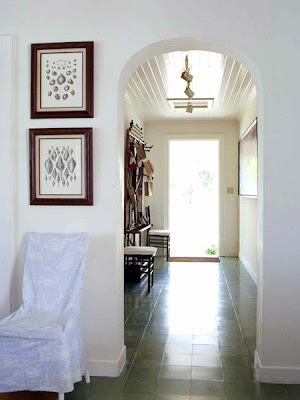 i love Tria Giovan's interior photos, these are so lovely! 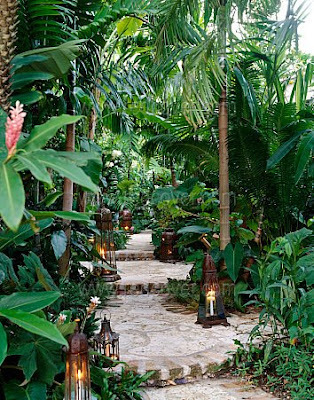 The walkway with the lanterns, that's where I would like to be right now! I love the box with the santo in it. Very rustic, haciendaish. Very nice. love the clean open brightness of these! very ahhhhhhhh! 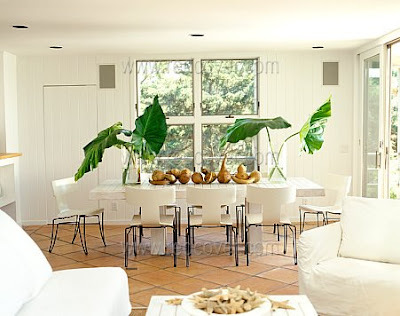 sometimes a simple, sparse and natural room helps me to think the best! love the overgrown garden walkway also...i love overgrown red ginger! Soooo beautiful! I think I love the one with the two mismatched wood chairs. But really, I love them all!! Yes, the first one with the huge demi-john! I love demi-johns!!! adore the 2 chairs and 3 frames.....it's talking to me !!!! !